‘Janet Craig’ plants are available in many sizes. Sizes range from small, young plants ideal for use in table-top planters, to bushes up to 5 feet in height that usually consist of 4-5 stalks in the pot. A unique cultivar of this plant is the ‘Janet Craig’ compacta. This variety has numerous smaller leaves growing close to the stem. This plant’s popularity has grown in recent years. This may be due to several studies that have demonstrated the ability of plants to remove harmful chemicals from indoor air. 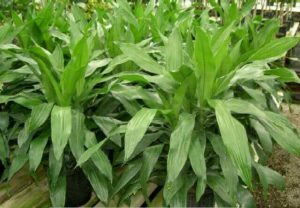 Dracaena species, including ‘Janet Craig’ varieties, rank high on this list. Specifically, they can remove significant amounts of VOCs (Volatile Organic Compounds). Benzene, formaldehyde, and trichloroethylene are three common VOC’s. This chemicals are released into the air from flooring and furniture. High levels of these chemicals are linked to ‘Sick Building Syndrome’. 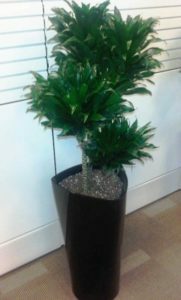 Care of a ‘Janet Craig’ Dracaena is straightforward. This plant requires very little water. It should be watered only when the top 2-3 inches of soil feels dry. It prefers to be watered from the bottom, as the roots are concentrated at the bottom of the pot. Overwatering will cause the ends of the leaves to turn black, and the stems to root. The soil should be porous and well drained. ‘Janet Craig’ Dracaenas are resistant to most pests. This plant prefers medium light, but will tolerate low light if watered sparingly. The stems can be pruned when they get tall. New shoots will form from the site of the cut. The cuttings can be rooted in water, or directly in soil. Dipping the end of the cutting in rooting hormone before placing in the soil will increase the chance of success.